ᱣᱤᱠᱤᱢᱤᱰᱤᱭᱟ ᱠᱚᱢᱚᱱᱥ ᱨᱮ ᱠᱤᱨᱜᱤᱡᱽᱥᱛᱟᱱ ᱵᱟᱵᱚᱛᱫᱽ ᱛᱮ ᱨᱮᱫ ᱢᱮᱱᱟᱜᱼᱟ ᱾. "Kyrgyzstan". The World Factbook. Central Intelligence Agency. ↑ "Constitution". Government of Kyrgyzstan. Retrieved 2009-09-23. 1. The state language of the Kyrgyz Republic shall be the Kyrgyz language. 2. In the Kyrgyz Republic, the Russian language shall be used in the capacity of an official language. 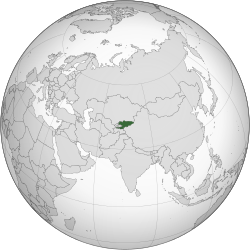 ↑ ᱓.᱐ ᱓.᱑ ᱓.᱒ ᱓.᱓ "Kyrgyzstan". International Monetary Fund. Retrieved 2012-04-18. ↑ "Human Development Report 2009: Kyrgyzstan". The United Nations. Retrieved 2009-10-18.